From the discriptions, using two wires in parellel is meaningless overal. Having multiple windings is essentially the same thing. You can have one thick wire, two thinner wires , three more thinner wires, etc. As you have more wires in parellel (looking at only a short segment of the magnet windings like it was independent). More windings means less total current through all of the windings to get the same strength B field, but it is a near tradoff. Each thinner wire can carry proportionatly less current, with the Ohimic heating being the limiting factor. The same applies to superconductor wires, though the limits are somewhat different. A super conductor wire can only carry a certain amount of current through a certain wire thickness, it is not unlimited. There is no Ohmic heating limit but there is a funtional limit due to local magnetic fields inside the wire. A thick copper wire might carry 10,000 A if you can cool it fast enough. A superconductor wire of the same thickness might be limited to a smaller to mildly larger(?) current. No cooling is needed except of course the maintenance of the initial cryogenic temperature. The high temperature superconductors seem to have less capacity in this regard, though things are evolving. I mentioned a near tradeoff because as the wire diameter is reduced , the number of wires can increase, but the insulting layer thickness becomes progressively more significant as a ratio of wire thickness/ diameter and insulation thickness. If a wire has a diameter of 1 mm with 0.1 mm thick insulation surrounding it then the conductive component of the wire is 80 % of the overall wire diameter (actually different as cross sectional area needs to be considered, but the trend is consistent). If the overall wire thickness is reduced to 0.3 m then the conductive component is only 33%. There all sorts of engineering tradeoffs in the electromagnets. Incidentally the idea of using Bitter electromagnet designs somewhat like those used in the worlds strongest electromagnets have been kicked around because of the engineering concerns of intimately cooling the wires that are carrying high currents. Splicing a single wire to a run of more wires, then merging the wires back into one might seem to be a solution to increasing the B field in the nubs between magnets, but when thought through the amp turns and thus B field strength would not change. Winding the magnets with a bundle of say 10 wires and then passing one bundle through the nub to the next magnet might help, but it introduces other concerns. Wiring each magnet completely separately with perhaps a bundle of wires feeding through the standoffs may be a simpler engineering solution with better standoff (nub equivalent) magnetic shielding and better cooling margins. Concerning tests with WB6 and I presume WB7 and possibly WB8.0, the magnets were pulsed in the sense that they could only be run for at most a few seconds before heat buildup necessitated shut down, but compared to other time frames in the machines, this was extremely long steady state B field conditions. The magnets only needed to be on as the switches were thrown and high voltage current and gas was introduced. In WB6 the gas introduction complications limited the tests to only a few milliseconds plus the delays in the crude switching systems used. The magnet heating was completely irrelevant. Once the magnet windings heated up there would be a needed cool down period which was presumably several hours as the magnets was in a very good vacuum thermos bottle. Active cooling would prolong the electromagnet run times a tiny to moderate amount of time depending on the flow rate, but this was not important for the tests, but only for the recovery time between tests. This generalization may be only partially applicable. WB4, which had active water cooling, was able to generate B fields of ~ 3000 Gauss. I don't know how far WB6 could have been pushed because they were running out of time and of course the electrical short fried at least one of the magnets. WB8.1 tests where they may have tried to increase run times well beyond the expected ion lifetimes (perhaps 20 milliseconds to hundreds of milliseconds), might benefit from more aggressive cooling of the magnets. But I suspect even here control of vacuum pressures, gas puffers and/or ion guns and electron guns were the more challenging issues. Cooling the electromagnet wires to liquid nitrogen temperatures may have been mostly for the improved conductivity (6+8 fold improvement) so that higher currents and thus B fields could be maintained for the tests. The cooling may (pure conjecture) have been much less than that needed to keep the electromagnets at near initial temperatures for many second time frames. If various engineering issues with switch timing, etc. can be managed, then even one second of magnet on time is practically forever at this stage of the research. Things change with greatly increased fusion power intensity/ time conditions. Then you not only need to keep the magnets cool for long times against the Ohmic heating loads but also Bremsstruhlung and neutron heating loads. With P-B11 fusion the neutron heating concerns are almost totally eliminated and this may be a big plus for this fuel choice, despite the increased Bremsstruhlung concerns. Superconductors would eliminate the Ohmic heating, but not the others. You will not be able to cool the super conductor to cryogenic temperatures and then need almost no additional cooling, there will have to be major active cooling to keep the magnet temperatures down, even with superconductors. If you read Tesla’s 1894 patent 512,340 on the bifilar magnet coil you will see that the purpose of the bifilar winding midpoint connection is to dramatically increase the amount of capacitive energy stored between each consecutive winding. Consider a single wire pancake coil with 1000 turns and 100 volts applied. There will be 0.1 volt difference between each consecutive layer in the coil. The capacitance of the coil will be mainly determined by the geometry (plate spacing) between each consecutive coil layer and is constant for a given coil. The capacitive energy stored in such a coil will be ~ E1 = 1/2 C V^2, or 1/2 C (0.1 ^2). On the other hand if you wind a similar bifilar pancake coil with 1000 turns (same total length of wire) and again apply 100 volts then the midpoint solder connection will be at 50 volts. Now the voltage difference between each consecutive layer in the coil has been increased from 0.1 volt to 50 volts. The capacitance of the coil determined by the geometry hasn’t changed; However, the capacitive energy stored in such a bifilar wound coil will be ~ E2 = 1/2 C V^2, or 1/2 C (50 ^2). Or 250,000 times greater than the single wire wound coil of the same inductance. It’s a super slick way to change an inductor into a combination inductive and capacitive energy storage device. A bifilar wound metal foil tape and wax paper coil (bifilar insulated ribbon coil) would greatly increase this effect. Don’t know how this could be useful as a magrid magnet coil though. Randy wrote: It’s a super slick way to change an inductor into a combination inductive and capacitive energy storage device. I just saw this mistake. DeltaV, I wasn’t aware of the Woodward-Effect until you mentioned it above. Since then I have Googled-up some Woodward-Effect pages on the net and now understand why you would suggest that Tesla’s bifilar inductive-capacitive energy storage device could be applied to Woodward’s concept. A bifilar wound pancake or ribbon coil would be its own right-angle aligned E-B field resonant tank circuit. There may be some potential applications in that arena. I have found a few examples on the net describing the USE of Woodward’s mass fluctuation equation. But I still have not found a proper explanation of where/how Woodward came up with this idea that such mass fluctuations should occur in the first place… I mean an explanation that’s simple enough for me – I’m a “keep it clear and simple” kind of guy. Do you know of any examples which clearly/simply describe/explain the derivation of Woodward’s equation? I think you get where I’m coming from. Any good pointers to a simple explanation to the origin of Woodward’s equation would be welcome. Thank you. On a side note, Tesla-style winding of coils made with ribbon conductors ought to be called "bilaminar" instead of "bifilar". DeltaV wrote: On a side note, Tesla-style winding of coils made with ribbon conductors ought to be called "bilaminar" instead of "bifilar". I agree, “bilaminar” in lieu of “bifilar” is a much more descriptive representation of such a ribbon coil construction. 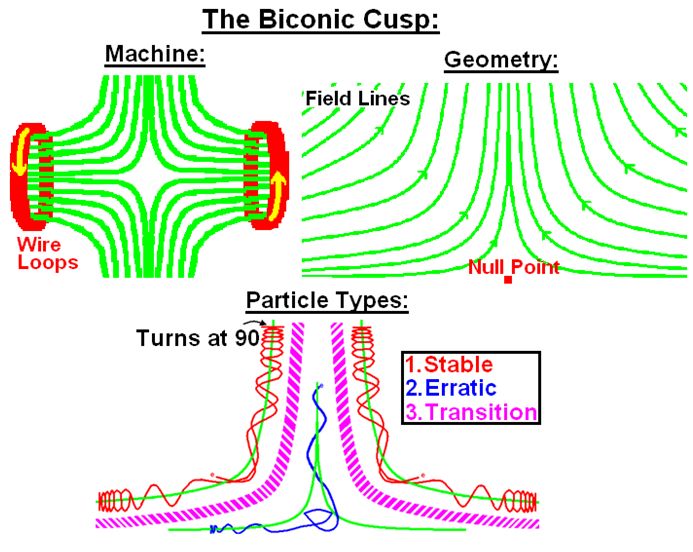 i.e., bifilar < = > pancake coil, bilaminar < = > ribbon coil. From the second “overview link” above, I find the “origin of inertia” topic to be most interesting. Recent astronomical experiments have confirmed that gravity travels at the speed of light as per Einstein’s General Theory of Relativity. But when an ice-skater spins in a circle, relative to the distant stars, she will immediately feel her hands pulled outward – away from her axis of rotation relative to the distant stars. There appears to be some immediate local interaction of an object’s change in motion with respect to the long-ago established local gravitational field existing between her and the distant masses. The ice-skaters motion changes cannot immediately interact with the distant mass of the universe because gravity travels at the speed of light. Maybe you can pull-off some funky stuff between mass/inertia and its interaction with gravity (locally) before it all gets combined to zero in the end? Randy wrote: But when an ice-skater spins in a circle, relative to the distant stars, she will immediately feel her hands pulled outward – away from her axis of rotation relative to the distant stars. There appears to be some immediate local interaction of an object’s change in motion with respect to the long-ago established local gravitational field existing between her and the distant masses. The ice-skaters motion changes cannot immediately interact with the distant mass of the universe because gravity travels at the speed of light. Just like with the EM field, the interaction is within the local field then radiates outwards. I would not consider that "funky". The ice skaters inertial interaction with the local space time metric is not electromagnetic in nature. So what is the nature of the local interaction with the metric that propagates outward to the rest of the universe at the speed of light? Outwardly propagating matter waves? Both inward and outward moving spherical waves are required to maintain a spherical standing-wave. I was very skeptical of Milo’s concept at first but after reading some of his ideas I remember using Mathematica to solve D’Alembert’s spherical wave equation and it had both an inward moving wave term and an outward moving wave term. Here’s the weird part. Each term on its own would diverge (blow up) at the origin so I initially dismissed the idea. Later I discovered that the SUM of the two terms converged into a finite-amplitude oscillating spherical wave. But it was as strange kind of wave… The central anti-node had twice the wavelength and much greater amplitude (energy density) than all of the external anti-nodes. I then thought (as Milo does) that this idea may form a simple representation of the matter part of a fundamental particle such as the electron. If such a spherical standing wave was accelerated with respect to the local space time metric then maybe the local SUM of the in-out matter waves (mass of the central particle) could intentionally be caused to change with respect to the local metric? Starting with there being no preferred coordinate frames in Relativity, oscillating a small mass with respect to a stationary universe is equivalent to oscillating the universe with respect to a stationary small mass. Inertia of a small mass is a "frame-dragging" effect involving the entire (observable) universe. Within a spacetime frame, the speed-of-light limit is in effect. Does this limit apply outside of all spacetime frames? I think the Alcubierre metric warp drive and similar ideas depend on such being the case, whether explicitly stated or not. For a spacetime "ocean" to exist, it must have something to exist in. Motion relative to the "ocean" is subject to the speed-of-light limit. Motion of the entire "ocean" is not. Counterintuitive, because our familiar H2O oceans are all embedded in spacetime, as opposed to enveloping spacetime. End highly speculative, headache-limited rant. Back to work.